Although he holds four patents for the Silver Falcon, a robot used for heart surgery, and has other patents pending, Akhil Madhani does not think of himself as an inventor. "I'm a mechanical engineer," he says. "Engineers have to invent things, because that's their job, to develop something as a solution to a problem." Nonetheless, his innovative work in robotics has brought him widespread recognition, including the 1998 Lemelson-MIT Student Prize for Invention and Innovation and recruitment by Walt Disney Imagineering, where he works on the development of the next generation of interactive robots for theme parks. Madhani visited the Lemelson Center in December 1999 to meet with students from four schools: the Ormond Stone Middle School in Centreville, VA; the Rosa Parks Middle School in Olney, MD; the National Presbyterian School in Washington, D.C.; and the Takoma Park Middle School in Takoma Park, MD. He shared with them his lifelong enthusiasm for making models and tinkering with machines, and he explained that robots are really just machines with sensors, computers, and motors. He told them that to develop something new in any field takes a lot of time and effort, with some little successes and many failures along the way. 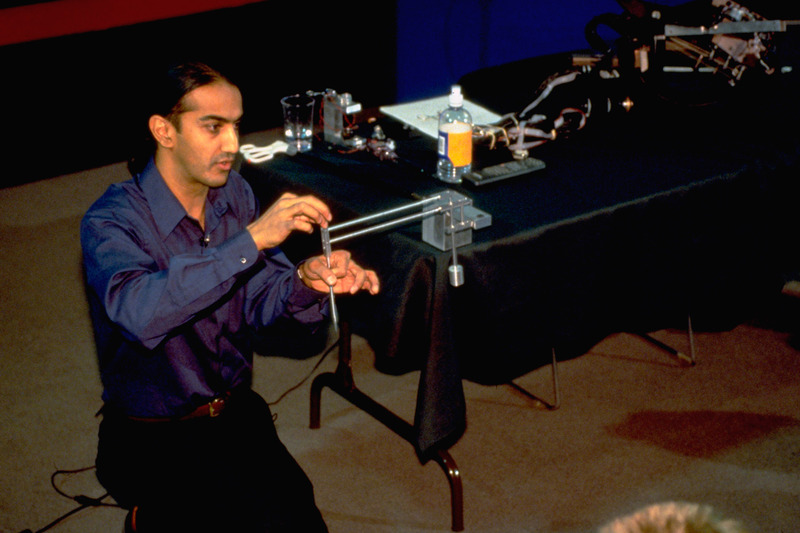 Inventor Akhil Madhani demonstrates how robot arms work during a 1999 Innovative Lives presentation at the Lemelson Center. Smithsonian photo by Hugh Talman. Madhani was born in 1968 in Nairobi, Kenya. His father, an orthopedic surgeon, is from India. His mother, a gynecologist, is also of Indian origin, but grew up in Kenya. The family emigrated to the United States and settled in Seattle, Wash., when Madhani was two years old. He absorbed his interest in science from his parents and his older brother, Hiten, now a professor of genetics at the University of California in San Francisco. With Hiten, he would build model rockets from kits and launch them. "Then they would blow up, so I'd just take the parts and make new versions, and we'd shoot them up in the air." But generally, he recalls, he was "just a normal kid, enjoying the standard stuff that kids do." He began his training in mechanical engineering as an undergraduate at the University of California, Berkeley, earning a Bachelor of Science with honors in 1989. His time there was occupied with classwork and studying. "I wanted to be a designer, but I was so buried in coursework that I never had time for other projects." On his arrival at the Massachusetts Institute of Technology (MIT) in 1989 for a master's degree, he was awarded a Warren M. Rohsenow Fellowship by the Department of Mechanical Engineering. It was one of two fellowships awarded that year to an incoming class of over 150 graduate students. When I originally went to MIT, I wasn't sure what I was going to do. . . . When you go there as a graduate student, you run around calling on different professors to see what work they have, and . . . they're looking for graduate students to [assist them]. I got a few different offers and ended up working for Dr. Steven Dubowsky, a professor of robotics. He was doing some work funded by NASA, and I just thought, "Wow! This is cool!" As a research assistant to Dubowsky, Madhani worked on several NASA-funded projects. One of them involved finding the algorithms (step-by-step computations) to describe the motion of a robot arm attached to a satellite in space. "If the robot is bolted to a satellite and the arm moves around, then the whole satellite moves around. . . . Most of the algorithms developed for robot arms were for arms that were bolted to a cement floor--not a wiggly base floating in space. NASA didn't know how to deal with that, so we worked on it." Madhani also got involved with other graduate students in building a robotic head in MIT's Artificial Intelligence (AI) Lab. There he met another professor who worked with robotics, Dr. J. Kenneth Salisbury. When you want to actually do something with an arm, you have to tell the arm where to go, and there are a lot of constraints on how the arm can move, in terms of its joints, torque, loads, etc. So I developed a whole system for telling the robot where it could go and how it could go. It was all done in software; there was really no hardware involved. He got his M.S. in mechanical engineering in 1991. Although he had no plans to go into a Ph.D. program, he took the precaution of taking qualifying exams before he left MIT. He decided that after six years of college and graduate school, he needed a break, so he spent some time traveling in Nepal with friends. When he returned to the United States, Salisbury, the professor he'd met at the AI Lab, offered him a funded position. "I'd already started shipping my things back to Seattle, and I ended up driving back across the country from Seattle to Boston" to accept Salisbury's offer, he recalls. Madhani returned to MIT in 1992 as a Ph.D. candidate and research assistant to Salisbury. With other graduate students, he experimented with vision- and touch-guided grasping robots. One of the robots, called "Fast-Eye Gimbal," developed by Nitish Swarap with Madhani's help, used camera eyes to track fast-moving objects. Independently, Madhani designed a robotic wrist and hand, which was named the "Talon." When the Fast-Eye Gimbal and the Talon were combined with a mechanical arm (the WAM, or whole-arm manipulator, created by Bill Townsend, a fellow graduate student who went on to become founder and CEO of Barrett Technology, Inc.), they functioned as a robot that could spot, track, and catch balls. All of these projects aided NASA in developing a robot that would be used to pick up rocks on Mars. Madhani also contributed to another NASA project, a glove-like "exoskeleton" that could be worn on a human hand for manipulation of "virtual" objects on a computer monitor. NASA was interested in some sort of virtual reality device that would allow them to train astronauts on earth to perform experiments in space shuttles, where there is no gravity. . . . One of the things you can do very easily on a computer is simulate objects floating around, but how do you manipulate those objects that are just on the screen? The idea was that if you wore a pair of these gloves and a pair of 3-D glasses, you could have a sort of virtual reality environment, where you felt as if you were manipulating objects that were floating. . . . You put your hand into this glove-like machine that had motors that rested on your forearm, and the idea was that you could grab objects virtually, and it would make you feel as if you were picking up a test tube or something. The glove transmitted the sensation of pressure of the object being "touched." Although Madhani feels that the project was not a complete success, he says they all learned a lot in the process of working on it. To fulfill his requirements for a Ph.D., Madhani had to do original research. He had heard about some work in teleoperated surgery--surgery by remote control--being done at SRI, a research institute in Menlo Park, Calif., supported by the Defense Advanced Research Projects Agency (DARPA). The Army was seeking ways to operate quickly on soldiers wounded on battlefields, without transporting them to hospital facilities, and DARPA was funding research on the problem. Teleoperated surgery would allow doctors in a central location at a distance to operate on soldiers in the field. When Col. Rick Satava, a representative of DARPA, came to MIT in 1995 to show a video about this technique, Madhani seized on the idea of adapting remote-controlled surgery for civilian applications. Madhani saw a special potential for using teleoperation for minimally invasive surgery (MIS). MIS, which Madhani had learned about from his surgeon father, is a new approach in which doctors use advanced technologies to minimize the impact of their work inside the patient's body. Since the late 1980s, surgeons have been able to do certain kinds of operations, such as gall bladder surgery, through tiny incisions using noncomputerized instruments that can be controlled manually. Madhani envisioned using computerized, remote-controlled robots to perform more complex and delicate kinds of operations. He was particularly interested in adapting the technique for heart surgery, which normally requires a very large incision and the breaking of several ribs so surgeons can reach the heart with their hands to sew blood vessels. "What if you could do heart surgery without making that big hole in their chest?" Madhani wondered. "What if you could make something that went between the ribs, so that you didn't have to break any ribs at all?" With his advisor Salisbury's help and encouragement, this idea became the focus of Madhani's Ph.D. thesis and culminated in the invention of a surgical instrument that he named the Falcon. Its development took three years and involved the collaboration of Salisbury and another scientist at MIT, Dr. Gunter Niemeyer, who was a post-doctoral fellow and good friend of Madhani. Their research was funded by the Army through Satava's DARPA program. "The work, in terms of sitting down and drawing, was done by me," Madhani explains, "but I never would have done some of these things if it had not been for Ken Salisbury. We met every week, and he gave me lots of ideas. . . . We worked together on everything. . . . And I credit Neimeyer with all the software programming in the Falcon." There were many trials and errors as well as obstacles presented by the medical community, who were wary of using robotic instruments for heart surgery. But Madhani and his team were persistent, and they eventually created a working model. It is a robot with an instrument that goes into the patient through a small incision. . . . It is operated by a sophisticated kind of joystick. A camera is inserted into the body through another incision, so the surgery can be seen on a video monitor. The device moves around; it can go in or out of the body. At the end is a miniature wrist and gripper, like a hand that has been shrunken down to fit inside the body. It contains cables and motors that drive it. Sitting at a console, watching the monitor that magnifies the images of the patient's organs, the doctor uses the joystick to manipulate the tiny "hand" inside the body, cutting and grafting arteries, making very small sutures, and tying knots. Recovery is potentially more rapid and less painful than after traditional surgery, as the patient has only two small incisions, not a large incision and cracked ribs, that must heal after the operation. Madhani could not test his invention on live human subjects; instead, he practiced on chicken from the grocery store. His experiments resulted in a more refined version of the equipment, which he named the Black Falcon (the original model was renamed the Silver Falcon). Once the design was sufficiently developed, Madhani and Salisbury applied for patents. Four have been approved for the Silver Falcon, with others pending for the Black Falcon. 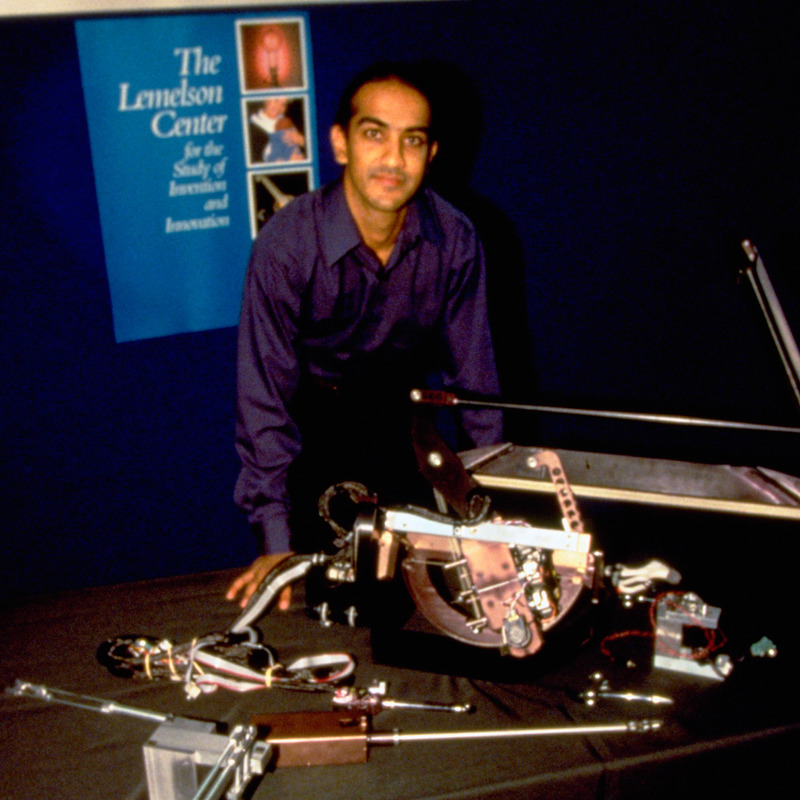 Akhil Madhani with some of his robot inventions during a 1999 Innovative Lives presentation at the Lemelson Center. Smithsonian photo by Hugh Talman. Around that time, Salisbury was contacted by Intuitive Surgical, a company based in Mountain View, Calif., that was also developing computerized instruments for MIS. They knew of Salisbury's reputation in robotics, but were unaware of his work with Madhani on the Falcon. Soon Madhani and Salisbury were hired as consultants for Intuitive Surgical, with an agreement that included the assignment and licensing of patents to the company. At the same time, the company designed their own, parallel version of the system, which incorporated some of Madhani's ideas and was featured in the fall 1998 issue ofLifemagazine. Madhani was awarded his Ph.D. in 1997 and received MIT's Carl Sontheimer Prize for Excellence in Innovation and Creativity in Design. The following year, he was selected for the Lemelson-MIT Student Prize for Invention and Innovation, and in 1999, he was named byTechnology Reviewmagazine as one of the "TR100," their list of the hundred most innovative people in the world under the age of 35. With his Ph.D. in hand, Madhani considered joining Intuitive Surgical, but engineering friends at Walt Disney Imagineering, Research and Development, Inc., persuaded him to bring his creative spirit and expertise to the challenge of Audio-Animatronic® figures. I'm a mechanical designer, I like building things. . . . At Intuitive Surgical, I didn't see the possibility of doing complete-from-scratch new designs for quite some time, whereas at Disney there were some totally "here's-a-blank-piece-of-paper, can-you-do-this?" type of projects. The offer was very attractive. Madhani joined Disney's senior research and development staff in 1997. The animatronic figures he creates for theme parks have a "fairly long development cycle," he says. Although none of his projects has yet been completed and installed, he finds his work satisfying. As you get better and better at being able to tinker with things, people let you do it for a living. . . . Twelve years of engineering school doesn't hurt either, because then they tend to let you do more complicated things, and you have some of the tools needed to do them, but that just makes it more fun. . . . If you look at the things [I've done], each project wasn't much of a deal in itself, but I just kept on doing one thing after another. . . . Invention is a lot more incremental than people like to make it sound.